Port-au-Prince, Haiti. I was afraid of Haiti due to the images of overwhelming poverty, the countless coups and endless violence. But I did choose Haiti – and others joined me in this effort. Together we set off to Haiti to try to organize a Haitian committee to build the project using many of our ideas and much of our funding. I had early concerns that it might be difficult to identify potential committee members and convince them to become involved. My minister asked me as we prepared to depart for Haiti what the exact plan was. I raised myself up to the theological challenge of such a question and told him boldly that it was “in God’s hands.” He laughed heartily and said that meant I didn’t really know. I smiled. I didn’t. As always, he knew me too well. As the plane touched down on the island, I could see shack after shack spread out below us. The heat hit us on the tarmac. Communication is a challenge in Haiti, as electricity and telephone links are intermittent at best. We headed for our base camp – an old French Victorian hotel called Hotel Olafsson in a neighborhood of Port-au-Prince against which the U.S. embassy warns foreign travelers. Coincidentally, Charles Adams stayed in this hotel and found inspiration there. Map of Haiti. Image: Wikipedia. They were very pleasant and invited me with such sincerity and expectation that it cut through my hesitation. I agreed to go the next night.They gave me their e-mail addresses, their home address, their telephone number, and complete names as we parted ways. The next night, after having left their contact information carefully in the hands of my American friends at the hotel, I walked again to the park. My potential hosts were waiting for me and lit up as brightly as the street lights around the park to see that the American had really come. We left for their home in spite of my apprehension, and as we left the circle of light and entered the pitch darkness of the streets, things seemed legitimate. Several blocks from the park, pitch black because the street lights had long ago failed, we arrived at a store. They informed me that their family home was up the hill behind the place, so we climbed up the broken steps, slipping in the overwhelming darkness. Water seemed to be flowing under our feet down the path, but I could not even see my feet. As I continued to slip, the two men gathered at my sides and held my arms firmly so that I didn’t loose my footing. I was secure. Escape was impossible. We arrived at a large cement block building. Many people were sitting on its steps in the dark – no lanterns, no candles – just people sitting quietly in the oppressive heat and darkness. My hosts proposed that I follow them up to the second floor. I was scared and realized that I could only be brutally honest. I explained that I was frightened and wished to go back to the street café to drink with them there. They tried to explain how safe I was, but I was resolute and we drank in the café instead. As the week went on I continued to meet with people across Haiti in shelters, orphanages, schools, and medical clinics. I learned much about Haiti and how its people have been exploited for centuries. The poverty in Haiti is incredible, and the opportunity for improvement slim. As I traveled Haiti and made friends with Haitians from all walks of life, I asked them about my friends in the park, and whether I should visit their home or not.My confusion gnawed at me; I felt I had been wrong in not accepting a gracious invitation, if that’s what it was. 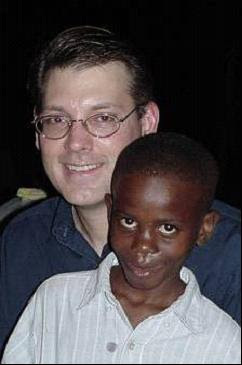 With Felix, a street child in Port-au-Prince. We returned to my hotel, a new experience for them, where we shared a drink and promised to be friends into the future. They still could not understand why I liked Haiti. I told them that it was because of the extreme beauty of the Haitian landscape and the Haitian people, and mostly because of my admiration for the strength and hope of Haitians. Haitians have been put down for so long that they should have just given up long ago, but they have not. They are filled with hope, resolve and strength. My trip to Haiti and my hopes for its people are like my trip to my friends’ house near the park. The way is dark, the path is slippery and filled with holes. But with faith and the support of the Haitian people I have come out in the clearing, and it is well lit and welcoming. I went to Haiti to offer a bit of hope and strength to an impoverished people.I left Haiti having instead gained hope and strength from these same people; I was the one who became empowered. I realized the resilience and fortitude of which humanity is capable, and I have grown as a result. I have now traveled to Haiti fifteen times and I still feel the same connection as I did on that first trip. Originally published in Orphans International History, April 2, 2008. This blog was taken from the e-book, Riding the Tiger: The Creation of Orphans International (ISSN 1234-5678-910). This blog follows the history of Orphans International Worldwide (OIWW) from the eyes of Jim Luce, its founder. Published by Orphans International Worldwide. Copyright 2006 Jim Luce. No parts of the book may be reproduced in whole or in part without the specific consent of Orphans International Worldwide, unless used for academic purposes. All rights reserved.